Q: How do I book a bouncy castle? A: Click on “Check availability and book online” section to get started, this shows live availability of all our bouncy castles so if the system says it’s available, it’s available! A: We now accept PayPal through our dedicated website for partial and full payments. Cash on delivery is preferred payment. A: A suitable space for the bouncy castle and a standard electrical socket are all that’s required. We’ll provide everything else. 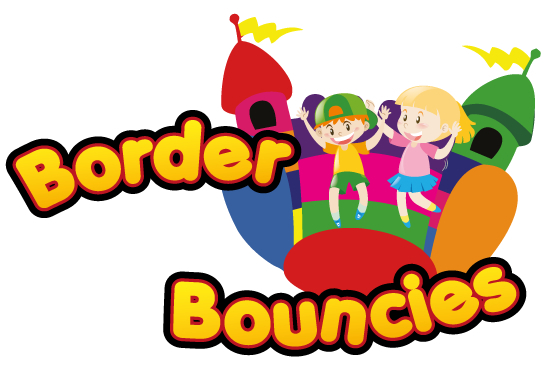 Q: Does Border Bouncy Castles have insurance? A: Yes, we have FULL public liability cover up £5 million, however as per our terms and conditions (which are similar to all bouncy castle hire companies) we cannot be held liable for any injuries caused whilst the castle is in your care. As the hirer you are the sole person responsible for the castle and its use, therefore should anything happen you are liable to a claim. For this reason you should arrange for one or more adults to monitor the use of the bouncy castle at all times to help prevent injuries. Our public liability insurance covers us against set up faults or faulty equipment etc. Q: What happens if it’s bad weather? – our bouncy castles can be used in light rain due to their sewn in rain covers. If the weather is bad/raining then call us and we'll decide what to do, or we may call you to say whether we will deliver or not. Q: What is our hire season? A: We offer our inflatable’s for hire all year round, 7 days a week 365 days a year. Q: Do you supply safety instructions? A: Our staff will give you a safety advice when they set up the bouncy castle for you. There's a quick reminder of sensible advice here too: http://www.biha.org.uk/safecartoons1/ - this will help prevent accidents and damage to the inflatable. Q: How much notice to I need to give to book a castle? A: As much notice as possible. During busy times we book up well in advance so let us know as soon as you have a date in mind, we will do our best to accommodate you. Our online booking system shows live availability of all our inflatables, so if the system says it's available, then you're good to go! Q: Do you charge for cancellation? A: In most cases we don't charge a cancellation charge, so long as you give us notice the night before 6pm, so that we can hire the castle out to somebody else. If you give us none or very little notice (other than for very bad weather) then you may be liable to a £25 charge. Q: Can the bouncy castles go indoors? - heights of all our castles are on our website. Also please ensure there is access to the location; deflated bouncy castles are surprisingly heavy and need to be moved on a trolley, so if you have a remote or unusual location miles from anywhere please let us know when booking so we can work something out! Q: Is it OK to put a bouncy castle on my lawn? A: We prefer to put the bouncy castle on a lawn area actually, and it will have a ground sheet placed under it so the grass will not come to any harm. For safety reasons we must hammer in a number of securing pegs to hold the castle down during use. The holes left over from the securing pegs will disappear after a few days. A: We prefer not to for safety reasons. If you have no alternative surface then please tell us this during booking so that we can arrange for sand bags to be in the vehicle when we deliver the castle. There may be an additional charge for this service. Q: Can I keep the bouncy castle overnight? A: We do overnight hire at an additional charge as long as we can be sure the bouncycastle won’t be damaged or stolen overnight, i.e. ; usually it must be indoors or in a secure back garden for example. Please enquire.